Pyper Creations: Mythical Faun Card- Using Flowers, Feathers and Fairies "Faun"
Mythical Faun Card- Using Flowers, Feathers and Fairies "Faun"
Hello Everyone!! How are you this fine Saturday morning? I'm so excited to share another Flowers, Feathers and Fairies digital stamp with you today!! Sabrina has been working so hard on getting some new images ready to release!! So stay tuned every couple of weeks for the next few months at least!! There are a bunch ready to go; the Design Team is just working hard to create some beautiful projects to show them off!! But today... the awesome "Faun" is ready to go!! And I am soooo in love with him!! Did you read Chronicles of Narnia growing up? Its one of my all time favorite book series and this image screams "Mr Tumnus" to me!! Wanna meet him?! How totally cool is he? Just something completely different!! And totally magical!!! Now wanna see what I did with him? I took the night scene lesson from my Kit and Clowder Elements of Nature class and created this magical night scene!! 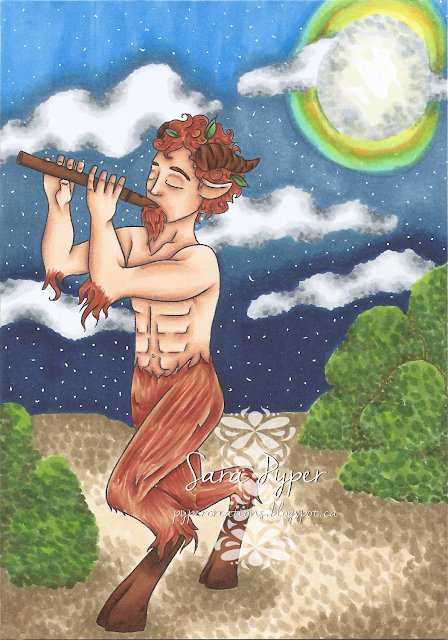 Most of the stories and legends and myths about fauns say that they have moonlight parties in the meadows where they play their flutes (recorders here in Canada) and dance the night away. 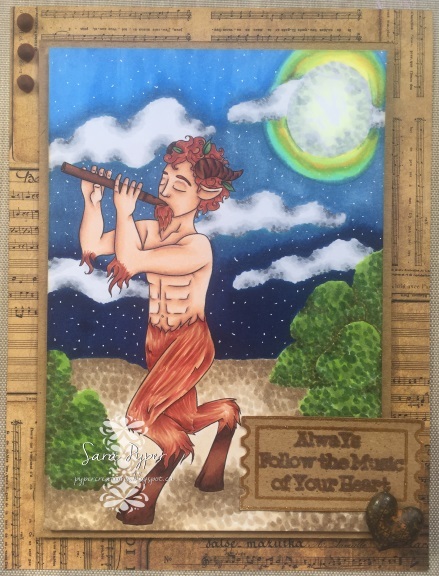 I really wanted to create that kind of scene and feeling with this card and just bring this Faun to life! I really think I created the magical feeling I was going for here with a touch of Narnian, old world distress. I love how this paper and sentiment just add the perfect touches to this Fauns musical evening! I hope you love this image as much as I do! Its available right now!! Yes, right now!! It is going live in the Flowers, Feathers and Fairies Etsy shop right this second!! So go grab it and have some fun!!! I am entering this card in the World Wide Open Design Team Challenge! Wow fabulous. Your image is coloured so beautifully and love the background you have created. Nice work. Thank you for sharing with us here today at World Wide Open Design Team Challenge and best of luck with your entry.